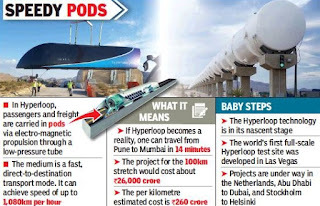 The pre-feasibility study by Los Angeles-based Virgin Hyperloop One and the Pune Metropolitan Region Development Authority has given a green signal to the Pune-Mumbai route for Hyperloop — the speedy mode of transport — and it could be a reality in 2026. The report of the preliminary study conducted by PMRDA and Virgin Hyperloop One was finalized on Monday. It would be submitted to the state government on January 15, said PMRDA commissioner Kiran Gitte. 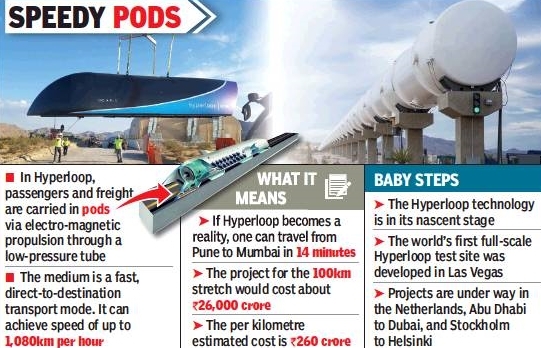 He said the team from PMRDA and VHO, who conducted the study, stated if all the sanctions, the actual study and the proposed demands were cleared, Pune-Mumbai Hyperloop should come into existence in 2026. The study to ready the prefeasibility study was undertaken in six weeks after the state signed a memorandum of understanding. The study ended in January first week. “They study has been very positive in terms of feasibility of the route as it has high density traffic and can be the most feasible. VHO is keen to have Indian engineering groups to manufacture the same locally,” Gitte said. The preliminary study was intended to analyse the benefits of Hyperloop technology, identify high priority routes and socio-economic benefits, and inform the government of any decision to progress to the full project stage. The study assessed three routes — Pune to Navi Mumbai to Sewri via the trans-harbour link, Pune to Mumbai via the Expressway and Pune to Navi Mumbai and then from Santa Cruz to the central parts of Mumbai. Gitte said the study cited that the Pune-Mumbai route was comparatively easier to be constructed in Pune than in Mumbai. But all the details would be tabled before the state government for further assessment.